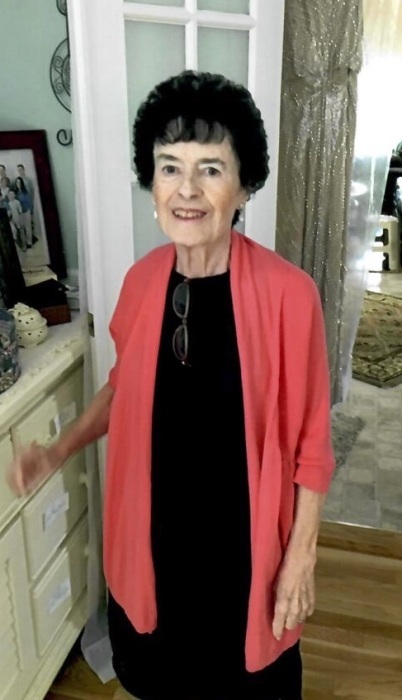 Visitation- Thursday April 11, 2019 from 2-4:30 & 7-9:30 p.m. our at West Sayville Funeral Home, 245 Main St.
Mary Ellen Boland (nee Rogers) was born August 6th 1933 in Brooklyn, NY. She attended OLPH, Fort Hamilton High School and Hunter College. She married Michael Boland on September 18th, 1954, and they remained together until his passing on April 19th, 2012. Together they had three daughters, Catherine (Rinaldi) who predeceased her, Helen (Willams) and Mary (Boland-Doyle). She is survived by daughter Helen Williams (Bob) , daughter Mary Boland-Doyle (Chris) , grandchildren Jessica Mary Rinaldi (Greg), Shannon Costello (Ed), Christopher Socko (Dahiana), Caitlin Barnes (Riley), Mick Doyle, Bizzy Doyle and Jimmy Doyle, great-grandchildren Edward Costello, James Costello, Gavin Buggy, Finn Buggy, Sophia Socko, Zoe Catherine Buggy and her seventh great grandchild, baby Barnes, expect in June. She was a beloved wife, mother, and friend and will dearly be missed, but we will celebrate her reunion with all those she loved that left before her. The kettle is on in heaven today.